With my love of medals, I was super excited to see the reveal of the Rock n Roll St. Pete 1/2 Marathon medal. It is perfect and I cannot wait to add it to my collection!! It is hard to believe that this race is 6 weekends away. With that said, Monday is the last day to register before prices go up. Right now the entry fee for the 1/2 marathon is $95. On January 1st, the prices will go up to $105. 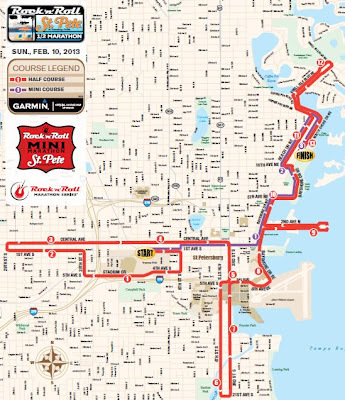 Register today to use the Rock n Roll St. Pete coupon code ROCKSTP2 and you can get the race for $85. Rock n Roll St. Pete also added a mini run to the line up! It's a 5K distance, with a finisher medal and certificate, an official event tee, One FREE Michelob Ultra at the finish line, festival live bands and cheer teams along the course finish line festival. Use the discount code ROCKMINI to save $5 at checkout. Click here for more details. 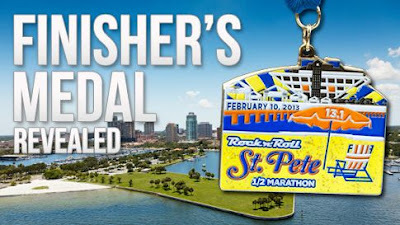 Click here to register for the St. Pete Half Marathon and save $10 off using coupon code ROCKSTP2!